The Buddies of the Brill are also looking for Transit related artifacts to display as part of the relocation and permanent display. Thunder Bay has a very long and rich Transit history starting with the the first municipality owned streetcar system in Canada in 1892. Streetcars were replaced in the 1940's by the trolleys and they were replaced by diesel buses in the 1970's. The changes are still happening with the inclusion of low floor buses and the future to include hybrid powered buses. Many families in Thunder Bay have been part of the workforce that made up the transit system over the years. Maybe your dad or grandfather or great grandfather was a streetcar driver or inspector or was a mechanic or service person years ago and your family has an artifact from that time period that you would be willing to part with as part of the Brill Trolley display. We are looking for any of the following. Old photographs of streetcars, trolleys buses .etc. 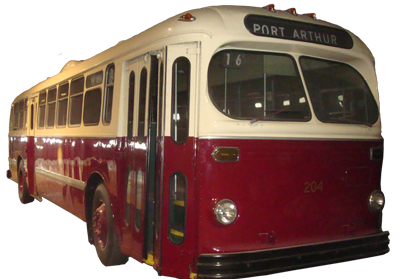 Photos of the shop areas of the transit facilities from both Fort William and Port Arthur. Photos of drivers or service personnel driving or working on streetcars, trolleys or buses. Physical artifacts as old uniforms badges hats, fare boxes, or any other physical artifact that could be displayed from anytime period.